The One-Line: When a charismatic conman seduces the citizens of Fat City with a miracle remedy for chubbiness, the local inventor must choose between helping the town or the love of the conman's super-slender assistant. Set: Simple. A park with a bench. 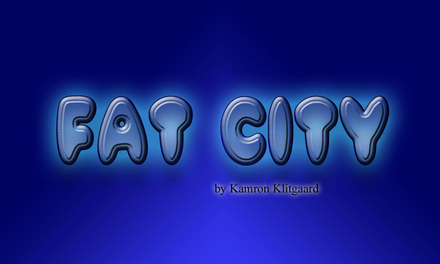 Synopsis: Everyone in Fat City is fat. Extremely fat. So fat that they can’t even get up by themselves after falling down, which seems to happens a lot. So the Mayor decides to hold a contest to see who can come up with a way to make the town thin. But when a likeable conman and his anorexic assistant wander into town selling “Fat Be Gone” pills, everyone forgets about the contest and goes for the quick fix, except for Jeffery, the local inventor, who decides to build a weight loss machine and save the town from the conman who is on his way to taking the town for everything they’ve got. Jeffery seems to be the only person in town who is thinking clearly, until he falls for the conman’s anorexic assistant. Jeffery will have to choose between love and making everyone thin. Note: Every character in the play except Harry and Hallie are extremely fat. The actors should wear stretchy material for their costumes in order to put as much stuffing in as possible. It needn’t look realistic either. Strange bulges will make it all the funnier. FAT NOTE: I was worried that the fatness theme might be offensive to some, but seeing that I am, well, pleasantly plump, and I was not offended, I decided to give it a go. Our opening night was a big success and I noticed that the people who where raving the most about how fun it was were the audience members who were on the portly side. Occasionally, we just gotta laugh at our selves.